What’s the best van for van dwelling? When I began my van dwelling career I had the same question, and I was stuck on it for several weeks. The whole van dwelling world was so new to me that I really had no idea what to look for, and I was afraid that I’d make the wrong decision. I decided to get this question answered. After doing some research, I put together a beginner’s guide to the different types of vans and vehicles that van dwellers might be interested in. 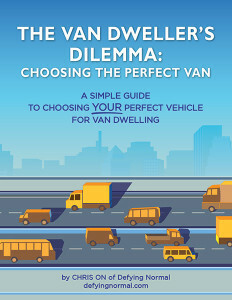 This is the guide that I wish I had when I was trying to choose a vehicle for van dwelling. Go get your free guide, and hey, don’t forget to come back here and let me know what you think!